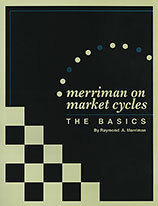 Merriman on Market Cycles: The Basics is a comprehensive and easily understandable guide on how to apply the study of cycles to enhance trading and investing in financial markets. There is an old saying that "timing is everything" in markets, and knowledge of cycles provides the most useful of all market timing tools. However, market cycles are more than just a consistent interval of time between two hights or lows. They unfold in well-defined patterns. These patterns enable the trader to know the phasing of any given cycle, and when the market is offering a great, or average, or not-so-great, risk/reward possibility. Furthermore, cycles sometimes fall outside the "normal" time band for their expected high or low due to a phenomenon known as "distortion". These patterns, and times of "distortion", can be forecasted by applying the principles of cycles which are clearly explained and illustrated in this unique book.